Selah TSA Students are DC Bound! Five Selah High School students already have plans for this upcoming summer that include taking in the sights at the Nation’s Capital. 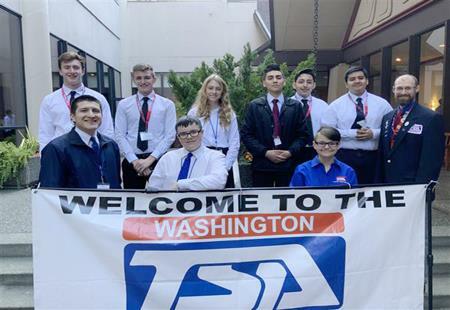 Selah students kicked-off the first weekend of their spring break by competing at the Technology Student Association (TSA ) State Conference and earning an invitation to the National Competition in Washington DC in June. After working on their projects for six months and competing at the state-level event, Dakota Alanis, Zoe Alholm, Kaitlyn Kinley, Hunter Jones and Jared Storseth, qualified for Nationals. During the state competition, Seniors, Hunter Jones and Jared Storseth, qualified for the national contest in the category Technology Problem Solving. The senior duo earned third place honors by using their skills to problem solve and develop a finite solution to a problem provided on site. The sophomore team of Alhom and Kinley punched their ticket to the national event by placing second in the Children’s Stories category where participants created an illustrated story of high artistic, instructional, and social value, which projected a science, technology, engineering, and mathematics (STEM) focus. Freshman, Alanis, qualified for the national competition after competing in two categories. Alanis placed fifth in Computer Aided Design (CAD) Engineering where participants used complex computer graphic skills, tools, and processes to develop three-dimensional representations of engineering subjects. Alanis also received fifth place honors in the category of Flight Endurance where contestants demonstrate flight principles with a rubber band-powered model aircraft. The Technology Student Association is the only student organization in Washington State devoted exclusively to the needs of students interested in technology. The organization helps students gain confidence and build their technical and leadership skills while preparing for careers in a technology-driven economy and culture. Congratulations to all the Selah students who competed at the Technology Student Association State Contest.